This link will offer you a whole suite of programs and you get to download them all in one go. The one we are looking for is the VE Configure program. 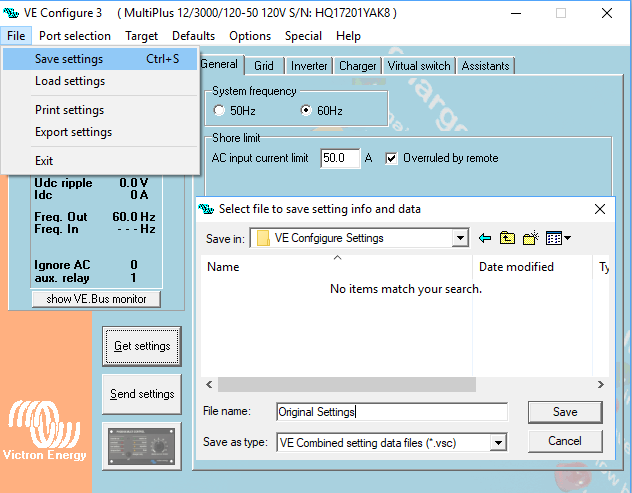 You may also need to download the USB drivers that enable your computer to work with the Mk3USB interface. 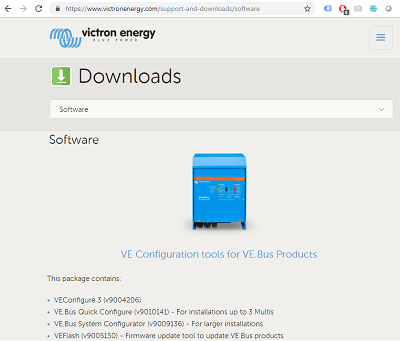 The other programs that are included with the package are used for larger installations involving multiple inverters, if you are planning on doing that you probably don't need this article. Sorry Mac users, these programs only run on a PC. When the full suite of software is ready for the VE Bus Bluetooth Dongle you will be able to program on the Mac but for now it requires a PC. On the download page if you scroll down you will find the official instruction sheet for the proceedure as well as a video on the subject. 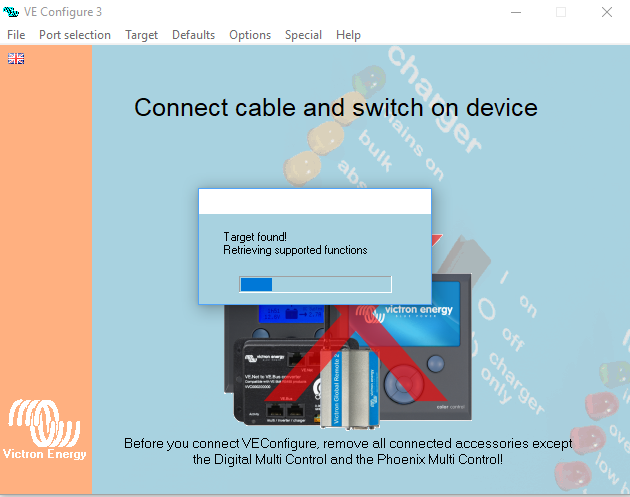 The instruction sheet for what we are doing here is A Guide to VE Configure. This article is just to provide some additional context to the official documents. The video describes the whole process quite well so I am not going to go through every part of it but I am going to discuss the bits that I found important. 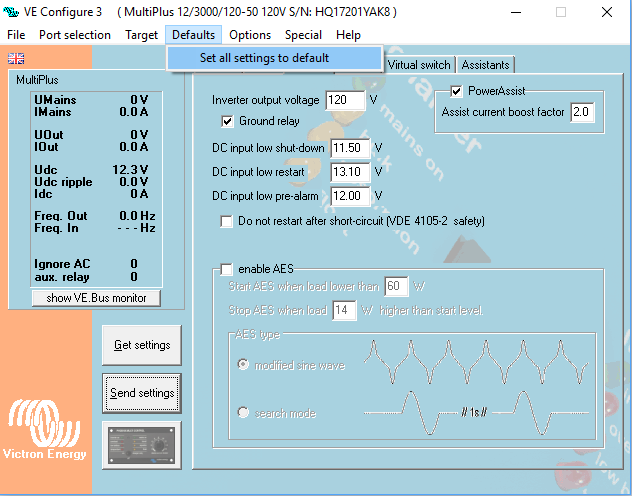 The video is using a smaller MultiPlus available for the European market but I am going to do this with reference to the US version of the 12/3000 Multiplus, officially called the MultiPlus 12/3000/120-50 120V VE.Bus. 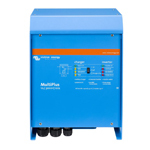 Later, when you are ready to connect to the actual MultiPlus you must disconnect it from AC Power, power it up from DC Power and have it turned on. 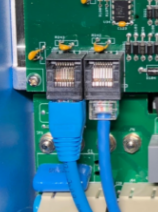 Then you need to connect the Mk3USB interface to the multiplus using either of the RJ45 ports shown in the picture below. You should unplug any other devices from these ports so the MultiPlus is connected to the Mk3USB and nothing else. 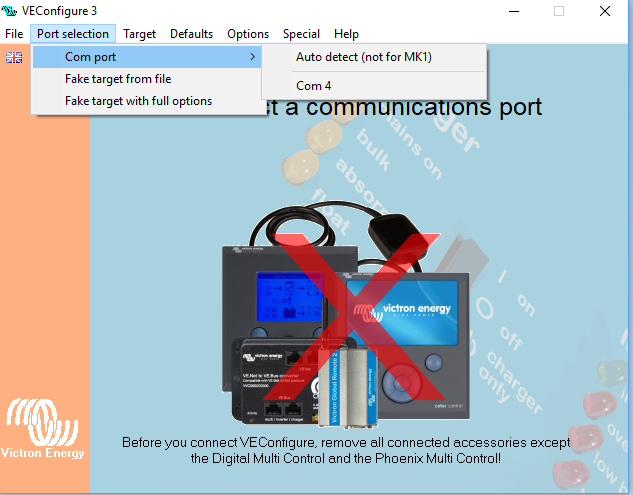 Then plug your Mk3USB into the computer and start up the VE Configure program. The video describes this perfectly well so I wont repeat it here. These are the RJ45 ports on the Multiplus. You should only be connected to the Mk3USB when you are programming, so unplug any other devices you may have connected. 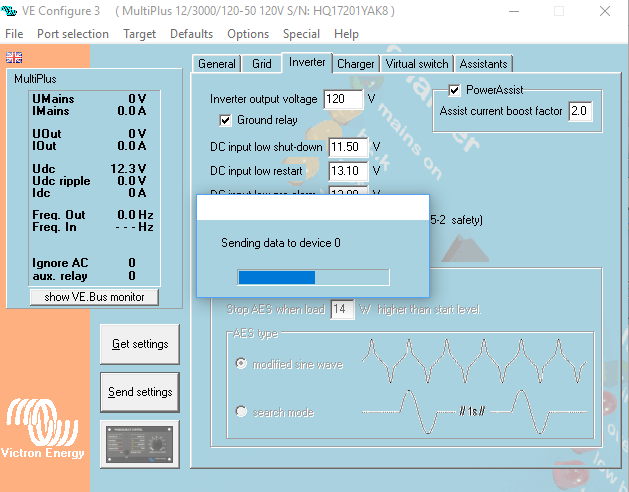 This next screen shows where you choose Auto Detect to select the Com Port. If it cant get it to work you need to go back and install the USB drivers and try again. Next save the settings to your computer so you can always go back to the way it was. Be sure to give it a unique file name like "original settings"
When you are finished making all your changes save the settings to your computer again with a new name this time. That way you can refer to them later, or send them to someone else to review if necessary. 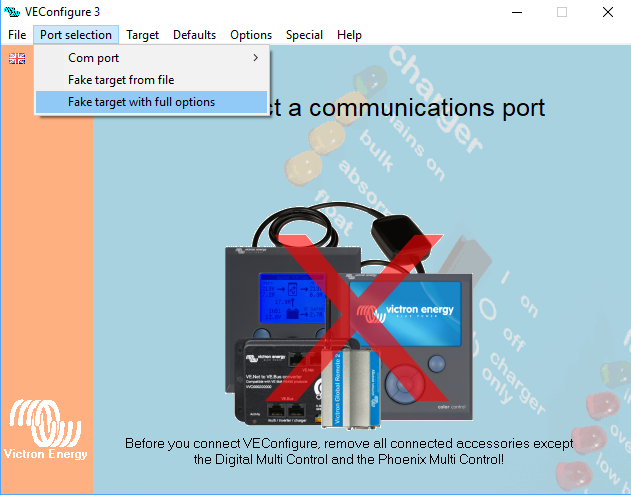 If you ever want to review them in future yourself you can run the VE Configure program in demo mode and instead of loading the fake target file you can open the file that you saved. 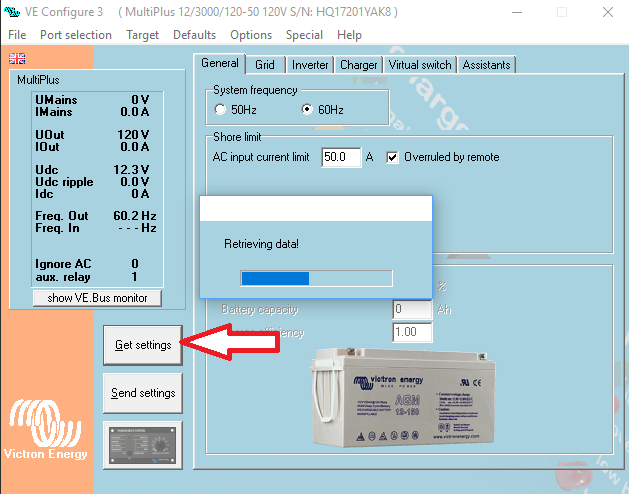 When you are ready send your changed settings back to the Multiplus as shown below. 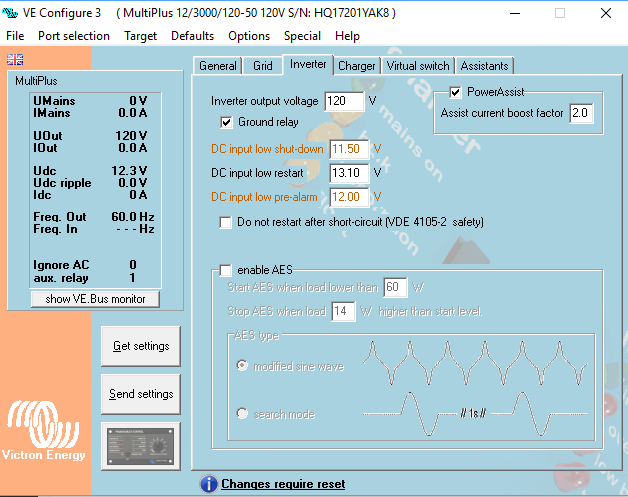 When complete the Multiplus will reset itself, the changed settings will turn back to a normal color, and the proceedure is complete. If you mess up you can always go back to defaults as shown below, or go back to your previous settings by loading the file that you saved at the start. You then have to send the default file back to the MultPlus to put it back the way it was before. This article described the proceedure but not the actual settings themselves. 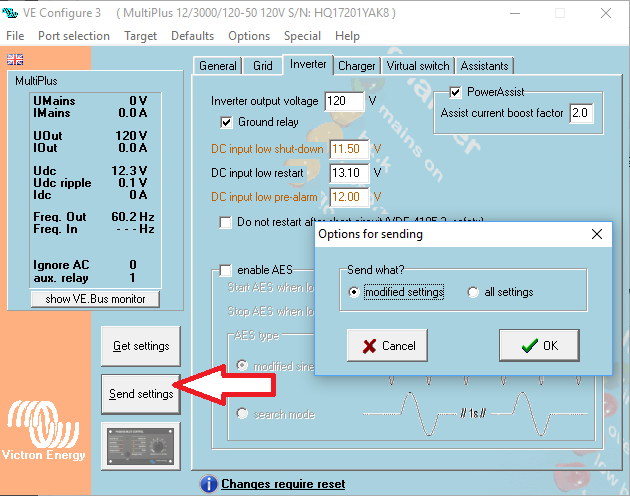 The next article will discuss the options available for the settings. Please feel free to add your comments or questions below, I will update the article in response to your input.